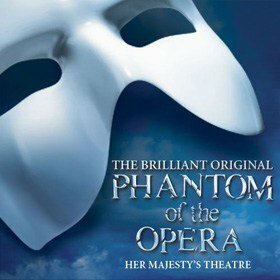 On Monday 10th October the West End Production of the iconic musical THE PHANTOM OF THE OPERA, at the Her Majesty’s Theatre, celebrated its 30th Anniversary with a special charity gala performance in aid of The Music in Secondary Schools Trust. To celebrate this milestone, the current stellar cast including Ben Forster as ‘The Phantom’, Celinde Schoenmaker as ‘Christine Daae’ and Nadim Naaman as ‘Raoul’ were joined onstage for a very special finale, by Andrew Lloyd Webber, Cameron Mackintosh, members of the original company including Michael Crawford and special guests Michael Ball, Sierra Boggess, and John Owen-Jones. This was streamed live via Facebook and at the time of publishing has been viewed by over 527,000 people. Andrew Lloyd Webber’s mesmerising score along with jaw-dropping scenery and breathtaking special effects, magically combine to bring this tragic love story to life each night.